What happens when you face adversity? What happens when things don’t go as expected? What happens when reality does not match up with your dreams? Making a bold decision is hard. I know. Leaving my career as a full time educator was one of the most difficult decisions I ever made. I ruminated over it for years. I’d also describe it as bold. I left a secure position with decent pay which also provided some fulfillment. But when I finally took that bold step, I did so knowing it was the right move. Know why? You see, while I can’t quite name what it was, I knew something was missing. My writing dream needed to be answered or it would have faded away – another in the pile of what could have beens. When I hung up the phone after announcing I was resigning, I was shaking. And I thought that was all it took. Since I took this dramatic action, since I was bold, things would just work out. Doesn’t every great story of success begin with a bold action? Point me to my success – I was ready. Well, it’s been a few years since I became a freelance writer. And I’ve had some successes. I’ve worked with some great clients and produced work that I’m proud of. I’ve also managed to eat and pay the mortgage. Yeah, I’ve had to dip into savings, continue to work part time in education (I do enjoy it – particularly in moderation), and experience some anxious moments. But all and all, things have been pretty good. But a roaring success. A titan. That’s where the New Year’s resolution comes in. I’ve come up with a plan and am determined to put more effort into my freelance writing business this year. I’m hopeful the business will grow as a result of that effort. As the year has started, I’ve done a few things towards achieving that goal. And I have much more planned. I’m excited and optimistic about these changes. In fact, putting in the effort itself is making me want to put in more. By putting in the effort, I’ve already succeeded. I don’t mean I’ve succeeded by the traditional metrics. I haven’t become the titan as mentioned above or added 12 new clients since New Year’s. However, I’ve been putting in the effort and maintaining a positive attitude. That’s what I can control. I can’t make someone hire me as a freelance writer. While I can show samples of past work, review how I can be of assistance, make clear I’m easy to work with, note that I’m professional, etc., the decision of whether or not to hire me is out of my hands. And there are many factors in the decision-making process, the majority of which I will never know. So, I’ll keep putting in my effort. Oh, so what’s up with strange word in the title – hishtadlus. Well, it’s a Hebrew word, and it means effort. Sort of. But it’s more to it than that. Put in your hishtadlus, your effort, and the rest is up to G-d. Again, I can control my effort. But I can’t control the end results. That’s out of my hands. That’s up to G-d (call it something else for those who are non-believers). By putting in my effort I’ve succeeded. Even on those days when I may not have it, as long as I put in the effort I do have, I will have succeeded. 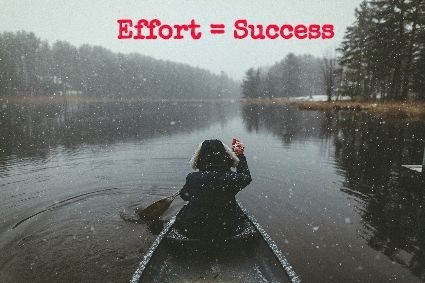 Effort equals success. So, I’ll keep grinding it out, putting in my effort, and the rest will take care of itself. That’s my resolution this year. *Count this one as blogging as therapy. I’m talking to myself as much as I am talking to you reader. I like it – sometimes it’s important to remember G-d likes when we put our faith in Him! Yes, I don’t see it as blind faith though. I’m doing what I can and going as far as I can and then.., Well it’s up to G-d. I don’t like the term but I suppose that is what it is.